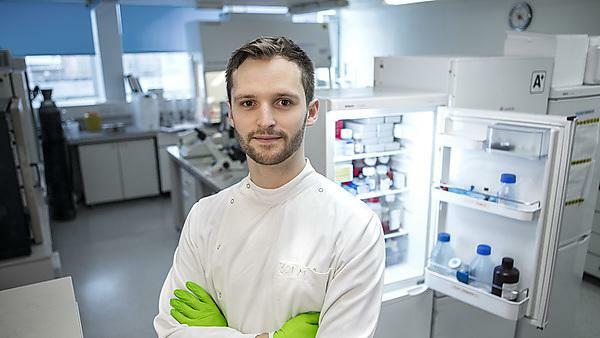 Tim Williams graduated from BSc (Hons) Biomedical Science in 2017 and currently works as a biomedical scientist for the NHS in Chichester. While at Plymouth, he received the award for the highest achiever for stage four. Plymouth’s open day was the brightest and most friendly. The buildings and facilities really impressed me, and the city as a whole seemed like a fun place to live. While I didn’t realise it until my placement year, the fact that my course was accredited was so useful as it meant that I didn’t need to do “top-up” modules to get onto the HCPC register. While training for my Health and Care Professions Council (HCPC) registration, I attended a multidisciplinary team (MDT) meeting alongside doctors and nurses from the haematology, radiology, oncology and histopathology departments. Being involved with in-depth discussions about the diagnosis and treatment of some complicated cases was really exciting for me. Studying at Plymouth hugely changed my career aspirations and plans. There were several students with aspirations so high that my perspective on careers completely shifted. That was balanced, however, by the experience and grounded, practical advice of my lecturers. Through the training and experience gained during my placement year, I managed to get a job as a biomedical scientist in the same NHS trust that my placement was in. So short term, it made a huge difference. Long term, it solidified my intentions of working in healthcare rather than research. At university, there are very clear objectives set at regular intervals. Despite having busy schedules, my lecturers were always happy to meet with me to give advice, feedback and offer a different perspective. The maths drop-in service, SUM:UP was also incredibly useful for my research project. I also can’t give enough credit to the café on the top floor of the library. With the benefit of hindsight, I would start the lab work for my research project sooner, and spend more days in the lab to take my research even further. I’m very driven now, and have so much trust in my own abilities and judgement that I didn’t have after A levels. Experience research-informed education by exploring the scientific basis of human health, disease and therapeutics. You'll benefit from a rich and varied learning environment that highlights recent developments and examines how these inform clinical and diagnostic practice. Receive the input of internationally-recognised researchers and NHS staff and open up a range of employment opportunities in both industrial and public research laboratories.